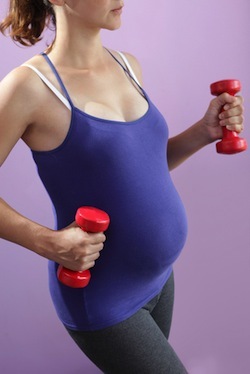 Exercise during pregnancy is important to improve the pregnancy outcome. Click here for the contraindications to exercise during pregnancy. Our 12-step program helps you improve your exercise during pregnancy. How far along: The gestational age of the pregnancy will often determine how strenuous the exercise regime can be. For women who are very active before becoming pregnant, the same level of activity can be maintained after pregnancy for the majority of the gestation. Know what exercises to avoid: There are some exercises that should be avoided when pregnant. These often include heavy lifting and long periods of aerobic exercise. Know what exercises are safe: The most common exercises to perform while pregnant include walking, yoga and stretching. There are some forms of aerobics that are safe, but high impact should be avoided for much of the pregnancy. There are exceptions to this rule, especially if the pregnant woman is used to performing high impact exercises before becoming pregnant. Do not overdo it: No matter how physically fit the woman, over doing it can be detrimental to the pregnancy. When the body triggers it is tired, the woman should listen. The most common symptoms are dizziness and pain. Stay hydrated: For every 15 minutes of exercise, the pregnant woman should drink water. This means stopping every 15 minutes to rehydrate the body. The body can deplete the water reserves in just a small amount of time while exercising. Can you do weight lifting exercises: Weight lifting may be contraindicated for some pregnancies. Ask your doctyor if you can do lifting of heavy weights during pregnancy. Eat accordingly: Weight loss is not an option for pregnancy. If the pregnant woman is exercising regularly, the amount of daily calorie needs goes up accordingly. The woman needs to eat enough calories to stay within a healthy weight gain ratio for her pregnancy. Notice the warning signs: Aside from dizziness and pain, there are other signs and symptoms that should serve as a warning sign for the pregnant woman. These include shortness of breath and cramping. Take frequent breaks: The mother breathes and the baby breathes. When working out, if the woman becomes too short of breath, the baby's oxygen level will suffer. This is why it is important to take a break every 15 minutes of exercise. This break is the perfect time to rehydrate. Avoid becoming overheated: When the heart rate goes above a certain level, the body will begin to sweat. While sweating is a part of exercise, the heart rate should stay below 140 while pregnant. Also, exercising outside while pregnant during times of increased temperatures is not safe as heat stroke can occur and affect the health of baby. Health complications (ongoing): If the pregnant woman has health complications, such as a heart condition, before she becomes pregnant, this health condition can affect her ability to exercise while pregnant. Health complications (pregnancy related): Health problems can also pop up as a result of being pregnant. These conditions, such as increased blood pressure, will affect the obstetrician's decision to allow the exercise or an exercise regime.